If you’ve seen exhibitions at the Hammer Museum or LACMA in recent years, odds are you’re familiar with the work of Scott Flax—though you may not know it. Flax designs the color schemes for art shows, matching the tone and pigment of the walls and information displays to the work that’s on view. The careful control of lighting, paint colors, and even different shades of white can enhance, even transform, a viewer’s understanding of the art on display. If your automatic mental image of an art gallery is a blank white space, think of Flax as a one-man army intent on changing your expectations. “I’ve known I have this ability with color and space since I was very young,” says Flax, who grew up in New York and has painted for as long as he can recall. After graduating from Pratt Institute, Flax worked as a muralist. Approximately 15 years ago he says he began to feel his age and knew it was time to get off the scaffold. His understanding of the ways color and space work together presented him with a new career: as an architectural colorist working alongside interior decorators and architects to create color schemes for the homes of clients. Architectural colorists choose every color in the private homes and public spaces they design, from exterior paint to the shades of furniture and textiles. 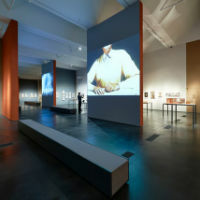 When Frederick Fisher (of the architecture firm Frederick Fisher and Partners, currently at work on a striking new building for Santa Monica’s Crossroads School for Arts & Sciences), with whom Flax had previously been in a watercolor painting group, approached Flax for his color expertise on Art of the Americas, Santa Barbara Museum of Art’s 2004 exhibition of art from the United States and Latin America, Flax started down a career path he has largely paved himself. “I am a new resource for museums,” says Flax, who has designed color programs for high-profile Southern California exhibitions like Hans Richter: Encounters and Calder and Abstraction: From Avant Garde to Iconic at LACMA and Expressionism in Germany and France: From Van Gogh to Kandinsky, which opens June 8 at LACMA. “There’s a big learning curve for everyone because museums are not used to having architectural colorists come in and work with them. Color can be a very consuming aspect of a project. For decorators and architects it’s nice to have someone whose singular agenda is that. I set up a kind of sandbox for people to play in,” Flax says. Check out Scott Flax’s work at the Hammer Museum where the current exhibition Tea & Morphine: Women in Paris, 1880-1914 runs through Sunday, May 18, as well as Expressionism in Germany and France: From Van Gogh to Kandinsky opening June 8.